For those of us who knew Narayana Kocherlakota as an academic, his recent behavior is a puzzle. As a practicing economic researcher, Kocherlakota taught us some useful things - about asset pricing, about optimal taxation, and about monetary economics, for example. He advanced economic science in important ways, and it's fair to say that we are much better off as a result. When Kocherlakota was appointed President of the Minneapolis Fed in October 2009, I think we all had high hopes. While a research group in any institution - academic or non-academic - can be fragile and highly-dependent on good leadership, a research department in a Federal Reserve Bank is potentially even more fragile. A Fed president has a lot of power, and Fed employees do not have tenure. Thus, the President in a regional Fed can, if he or she chooses, play a large role in shaping the direction of research, and the choice of personnel to do that research. In October, 2009, I think the consensus opinion was that the Minneapolis Fed under Narayana Kocherlakota was in good hands. It was expected that he would preserve the excellent research operation that had been built up over the course of close to 40 years - an operation that played some role in 4 Nobel prizes in economics, for example. As well, we expected big things from a top-of-the-line researcher, who could apply his skills in new and fruitful ways to the science of monetary policymaking. 1. The state of the labor market represents a problem. The unemployment rate remains high but, more importantly, the employment/population ratio is very low and should be increasing. 2. Monetary policy can do something to solve this problem. Why? Because there exists a Phillips curve tradeoff. The inflation rate is currently lower than the Fed's 2% long-term target, and so we can have more aggregate economic activity and more inflation, and have the best of both worlds. 3. We can learn from the behavior of the Fed during the Volcker era. Kocherlakota argues that, in 1979, the FOMC embarked on the right kind of monetary policy for the time, which he characterizes as "goal-oriented," i.e. the Fed decided to reduce the inflation rate, through whatever means possible. What should the Fed do now? Reduce the unemployment rate and increase employment through whatever means possible. Basically, Kocherlakota thinks that any lack of success the Fed has had in changing the state of the labor market is due to public perception that the Fed is not serious about it. He thinks the public does not believe the Fed is committed to the second part of the dual mandate, i.e. "maximum employment." Since Volcker-era monetary policy plays an important part in Kocherlakota's argument, it's useful to review what happened in that period. First, it was widely-accepted by the late 1970s that it was feasible for a central bank to control the rate of inflation. It was also well-understood that the Fed was capable of reducing the inflation rate from levels that were deemed too high, to something lower. The debate was over how costly such an undertaking would be, and how long it would take. Some thought that a "cold turkey" approach was optimal, and "gradualists" thought disinflation should proceed slowly. Some thought that a key problem was the slow adjustment of inflation expecations; some thought that the central bank might have a hard time credibly committing to disinflation. Ultimately, the costs of disinflation turned out to be smaller than the gradualists expected. 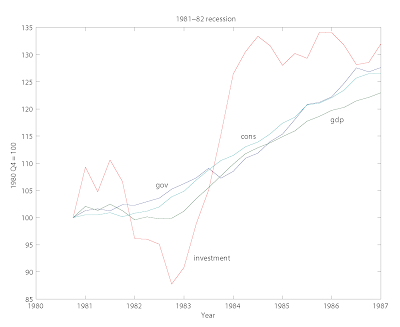 The 1981-82 recession was relatively severe, but not so long-lived, and inflation was brought down quickly. The Fed did not seem to have suffered an inability to commit. Kocherlakota likens the Fed's current predicament to the one it faced in 1979, and advocates for a similar "goal-oriented policy." There are plenty of problems with that argument. First, the goal in this case hard to define. What does the Fed want and what should it want, in terms of labor market performance? Kocherlakota is unhappy with the current state of the labor market and thinks we should do something about it. But what ails the labor market exactly? There are more people unemployed and less employed than was the case in early 2007. Kocherlakota should be able to tell us how we'll know the state of the labor market is good, so that, when the time comes, we and the Fed can stop worrying about it. He is on the record as supporting a 5.5% unemployment rate as a threshold for future monetary policy actions, but in his talk he seems to want to focus on the employment/population ratio. What ratio does he "like" under the current circumstances, and why? Second, in contrast to a goal of reducing the inflation rate in 1979, changing the state of the labor market may not be feasible for the Fed under the current circumstances. Kocherlakota told the Rotary Club in Houghton Michigan that feasibility was obvious. Why? Because the inflation rate is below 2%. Kocherlakota's notion seems to be that there is a policy, not already attempted, that can both increase the inflation rate and increase aggregate economic activity. That policy is forward guidance - forward guidance that is somehow so clearly and forcefully stated that everyone recognizes the Fed's commitment to its goal, and this becomes self-fulfilling. The problem is that the Fed has already tied itself in knots with its forward guidance. Forward guidance has now been changed enough, and is written in sufficiently vague and complicated terms, that those words in the FOMC statement have become meaningless. This is why the Fed had trouble with its communications, beginning in May of this year. Faced with something more tangible - talk about "tapering" - markets responded. Third, the goal itself may make no sense. As I discuss in this post, more than 5 years after the Lehman collapse, it's highly unlikely that much or any of the low level of employment in the U.S. is explained by wage and price stickiness in the face of the financial crisis shock that we suffered. If there's an inefficiency that explains why we are seeing low labor market activity, it's something other than price/wage stickiness - something that we understand imperfectly. Whether or not monetary policy can do anything about that is something we don't know. The Fed does indeed have a credibility problem. That credibility problem comes in part from implementing policies - quantitative easing (QE) in particular - the effects of which are imperfectly understood by economists inside or outside of the Federal Reserve System. We don't know what mechanism is at work, we don't have any idea what the quantitative effects are, and yet Fed officials confidently support the use of QE in public, as if they knew exactly what is going on. Further, it is well-known that the real effects of monetary policy are at best temporary, but Fed officials like Kocherlakota seem to want to argue that the failure of policy to "cure the problem" is just a license for doing more. The interesting part of the comparison to 1979, is that the tendencies we see in someone like Kocherlakota are similar to the ones that got us into the predicament that the Fed set out to solve in the Volcker era. But now, as I argued in this post, the policy error in 2013 may be that the Fed creates too little inflation rather than too much. The important news, of course, in the FOMC statement from yesterday is that there will be no tapering yet. Somehow, this came as a surprise to financial market participants, apparently, and I'm not sure why. There was essentially no news in the last employment report (more of the same, essentially), and rumblings on Capitol Hill are making people nervous about fiscal policy, so in terms of how the FOMC members think, the news is a little on the negative side. Given the reluctance to begin reductions in the rate of asset purchases at the last meeting, why would the Fed want to start now? The Committee sees the downside risks to the outlook for the economy and the labor market as having diminished, on net, since last fall, but the tightening of financial conditions observed in recent months, if sustained, could slow the pace of improvement in the economy and labor market. That "tightening in financial conditions" is the increase in bond yields (nominal and real) that has occurred since May, which is attributed mainly to how financial market participants have interpreted public statements by Fed officials - Bernanke in particular. The language in the statement might appear puzzling, if you thought that the increase in bond yields, brought on by the Fed, was part of their intention. It appears that the tightening financial conditions were unexpected from the Fed's point of view, so the postponement of tapering is in part an attempt to cool this down somewhat. Unless we expect real rates of return on safe assets to remain low indefinitely, the Fed will sooner or later have to start increasing its policy rate (whatever that rate may be in the future). If it wants to be consistent with the policies that got the Fed's balance sheet into its current state, the rate of asset purchases will have to be reduced to zero before "liftoff" (an increase in the policy rate above 0.25%) occurs. Of course, it's not out of the question that, in unusual circumstances (an unexpected spurt in real GDP growth or inflation) liftoff could occur before tapering is done. One possible complication in the Fed's exit plan is the upcoming change in leadership. With Larry Summers out of the running, chances are that Janet Yellen is the new Chair, in which case the timing of asset purchases does not really matter. If Yellen is nominated soon, chances are that tapering begins after the December FOMC meeting, which is followed by a press conference (no press conference after the October meeting). But, if Obama nominates someone else, then there are difficulties with committing to a tapering program before the new Chair is in place. However the first meeting post-Bernanke will be in March, and the current FOMC may think that is too far off. Once tapering begins, asset purchases will likely be reduced by about $10 billion a month, but possibly more if tapering begins later. Here is the letter from Summers to the President, withdrawing his name. We certainly can't say that Summers is incapable of doing the right thing at the right time. I'm sure there are some sighs of relief in the Federal Reserve System. I would think Janet Yellen's appointment is all but assured, but the Washington Post doesn't think so. Sluggish Growth: What's Going On? As we're approaching the 5th anniversary of the Lehman collapse, and everyone seems to want to write about the fallout from the financial crisis, now seems a good time to take stock of the macroeconomic consequences of that event. 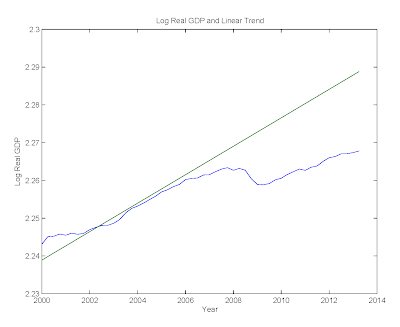 The first chart shows the log of U.S. real GDP, and the linear trend that best fits the whole post-1947 time series. That's quite stunning. 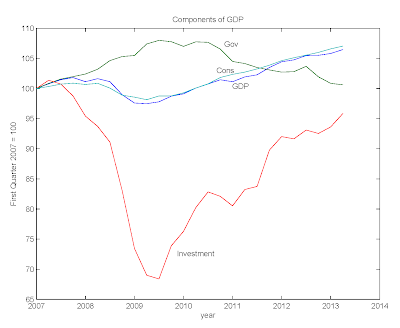 In terms of our standard measure of aggregate economic activity, the U.S. economy did not "recover" from the previous recession in the usual sense. 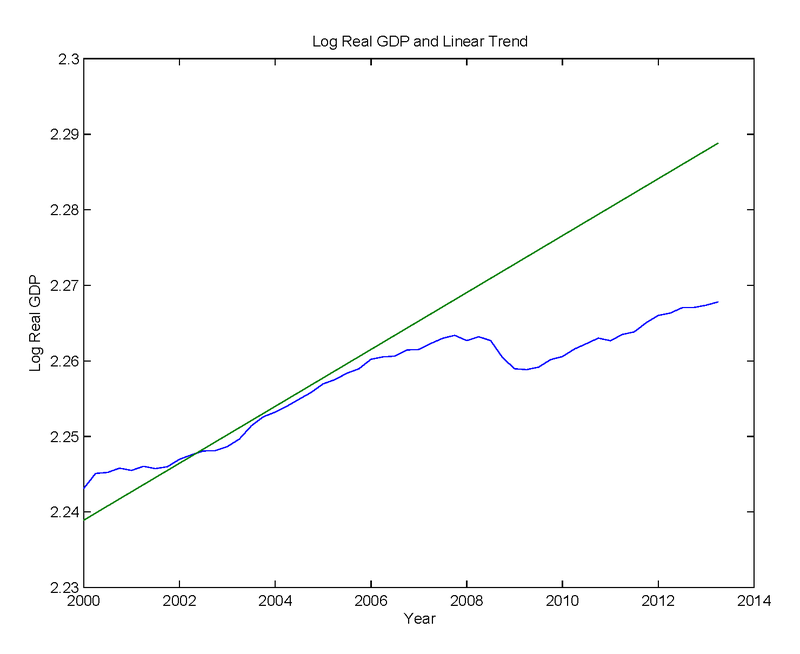 Real GDP is far below the post-World War II trend, and is growing at a rate less than the average growth rate over the period 1947-2013. If you have read Reinhart and Rogoff's book, maybe this doesn't surprise you. Reinhart and Rogoff tell us that recoveries from financial crises tend to take a long time - financial crisis shocks have very persistent effects. So, if we think that Reinhart and Rogoff know what a financial crisis is, and all those previous crises really have something in common with our experience in 2008-09, then that gives us something to go on. Maybe what we're seeing in the above chart is related to financial factors. But what exactly are the financial shocks associated with a financial crisis, and how do those shocks propagate themselves? Unfortunately, Reinhart and Rogoff aren't going to tell us much about that. What's going on? I think most economists recognize that policy played some role in causing the financial crisis - if only through poor regulation - but does our current sluggish growth path represent some dramatic failure of economic policy post-crisis? Are policymakers such dummies that they have failed to implement obvious solutions? Is there some unusual market failure at work that we have failed to understand? Or is what we're seeing actually the best possible outcome we could have hoped for, given what happened in 2008-09? New Keynesians, on the other hand, are serious people. They have models, which incorporate bits and pieces of well-accepted economic theory, and they fit those models to data. The New Keynesian story about the recent recession is that there is a shorthand for a financial crisis shock - it's a preference shock. Consumers became much more patient during the financial crisis, and that patience has persisted. Unfortunately, given that type of shock, conventional monetary policy cannot correct the ensuing sticky price problem, because of the zero lower bound on the nominal interest rate. With no movement in anticipated inflation, the adjustment that has to occur is a reduction in consumption and output. But prices will adjust over time of their own accord, and the sticky-price inefficiency (relative prices out of whack) will go away. The question is, how quickly does this happen? Is this a case of "in the long run, we're all dead," or what? Well, considerable effort has gone into studying price adjustment at the micro level, of late, so we know something about this. The best summary of evidence, to my knowledge, is in Klenow and Malin's chapter from the recent edition of the Handbook of Monetary Economics. 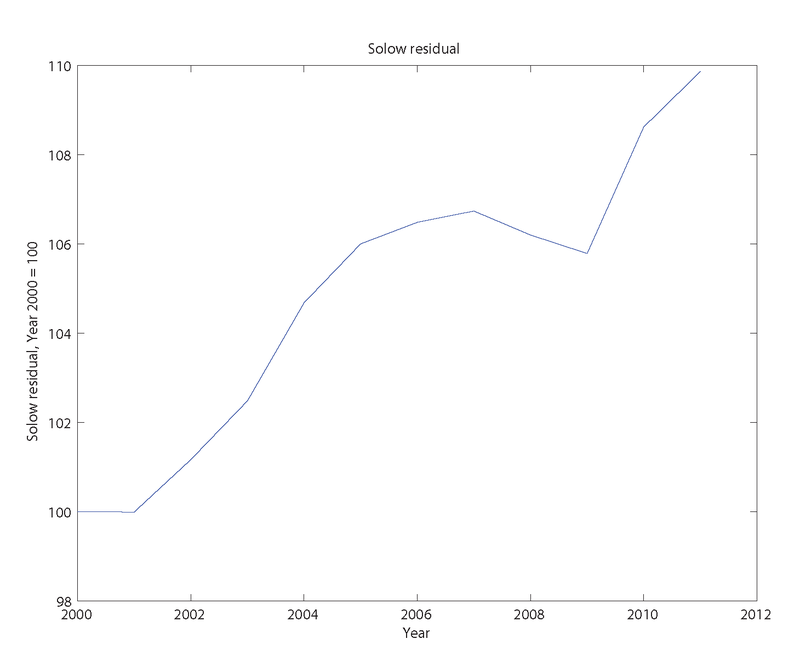 Klenow/Malin conclude, among other things, that the average length of time between price changes is about one year. That's a longer period than what Bils/Klenow reports, which was a period of four months. The difference seems to be due to the fact that Klenow/Malin choose to exclude price changes from sales, for example. Toothpaste could be priced at $2.00, go on sale for a week at $1.50, then go back to $2.00, and Klenow/Malin would not count that as a price change. So they seem to be bending over backward to make prices look more sticky. But even if all prices change once every year, if we suppose that there was one financial-crisis shock that occurred in the fall of 2008, then five years later we won't have much residual inefficiency due to price stickiness. Further, Klenow/Malin report that prices are more flexible for goods that are cyclically sensitive, i.e. 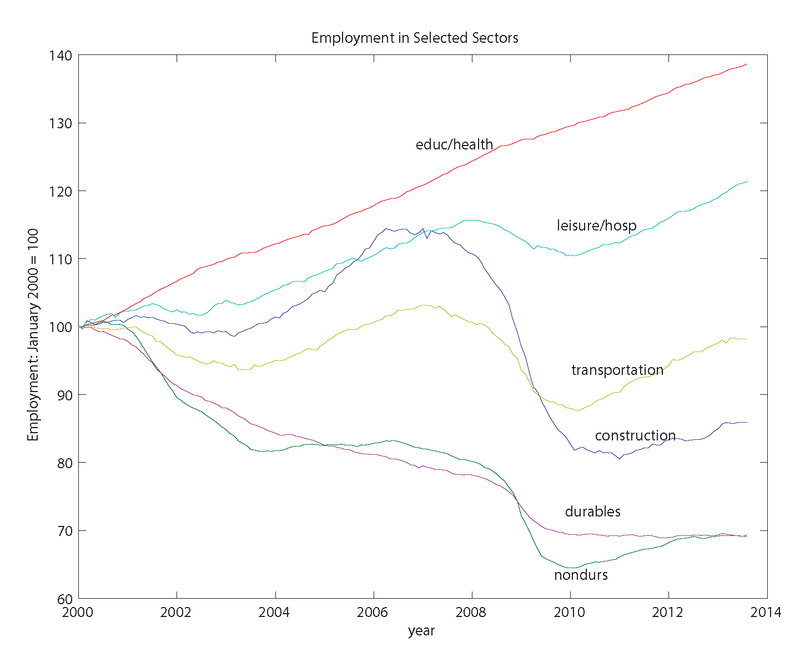 sectors of the economy for which employment and output are more variable relative to trend. Since those are the sectors where the friction would have to matter in delivering the large drop in output we're seeing in the first chart, it's hard to see why a New Keynesian sticky price mechanism is explaining what we're seeing. Further, what we should be seeing, according to New Keynesian models, is real GDP returning to the post-war trend, and a gradual increase in the inflation rate as that happens, as we should be climbing the New Keynesian Phillips curve. But that's not what's happening. People at the Fed and elsewhere are using New Keynesian models as forecasting tools - that's in part why they've been over-optimistic. In a New Keynesian model, a shock hits, and there is some direct effect from the shock (what the frictionless model delivers) and the indirect effect from the sticky price friction. Ultimately the indirect effect dies out, and the economy returns to it's TFP-growth-driven trend. Whether the nominal interest rate is at the zero lower bound will make a difference, as away from the zero lower bound monetary policy can give quicker adjustment of relative prices. But sellers are not going to change their prices any more or less quickly because the nominal interest rate is zero than otherwise, everything else held constant. There's an additional puzzle associated with that idea. The next chart shows my crudely constructed measure of TFP (total factor productivity), using annual capital stock data (available only up to 2011), and household-survey employment. There's no particular problem with TFP growth. Indeed, TFP grew at a relatively high rate in 2010 and 2011. The average rate of growth from 2000-2011 is about 0.9%, which is lower than the post-WWII average of about 1.2%, but that's not bad, given the effects of two recessions over that period. Thus, the U.S. economy is very productive, but the quantity of labor input is really low, as we all know. Speaking of employment, it's useful to look at what is happening across sectors of the U.S. economy. 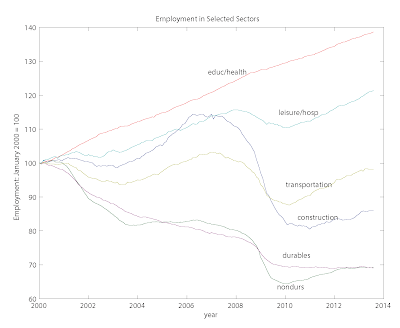 The next chart shows some selected components of employment, for the period 2000-2013. 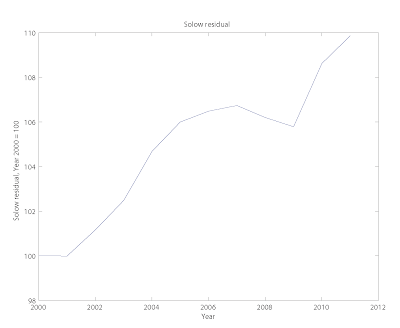 I've normalized each time series to 100 at the first observation. The key message here is dispersion - employment growth has differed markedly across sectors over this period. Employment in durables and nondurables manufacturing fell by about 30% over the thirteen-year period while, at the other end of the spectrum, employment in education and health care grew by almost 40%, and in leisure and hospitality by more than 20%. Construction, which was an employment-growth sector until 2006, suffered the largest employment decline during the recession. Thus, some of the dispersion in employment growth is the result of the recession (construction), but a good part is the result of secular changes in the composition of employment. This is important, as we want to understand more about these long-run changes in sectoral activity - what is due to technology, what is demand shifts, what might be due to the financial factors at work during the recession. I've written before about how it is difficult to square the experience we've had with sectoral shifts with sticky price theory. Relative stickiness in prices has implications for secotoral employment over the business cycle, but those implications are not consistent with the above picture. What about wage stickiness? That's certainly important in the Keynesian narrative, though New Keynesians tend to think more about sticky prices. Suppose, for the sake of argument that a particular worker's wage had been stuck at its pre-financial crisis nominal level until now. How much would that worker's wage have declined in real terms by mid-2013? The answer depends on when the worker's wage became stuck. If it was in January 2007, the decline would be 12% (using pce inflation); if in December 2007, 9%; and if when Lehman went down, 6%. That's large in any case, and that's with zero adjustment over 5 or 6 years. You think wage stickiness matters over that length of time, or that wage stickiness somehow explains the drop in employment we saw in the construction sector? I don't think so. 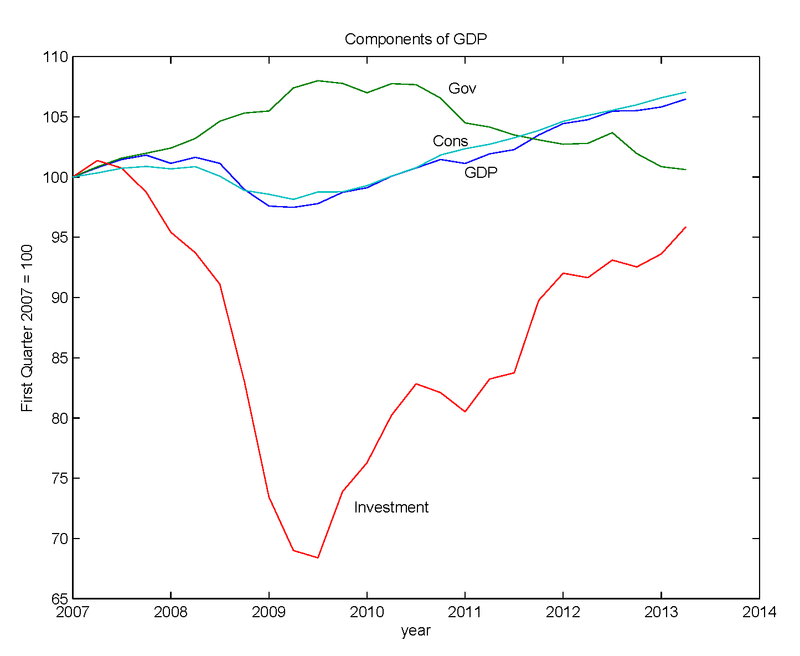 Another useful exercise is to look at the time series for the components of GDP since pre-recession times. The next chart shows these, leaving out net exports. Then, compare that to what we see for the 1981-82 recession. In the next chart, I've made the sample period the same length as in the first chart, and the first observation is the same number of quarters before the beginning of the recession, the way the NBER dates it. First, focus on government expenditure. At the turning point in the recession, that's actually higher, relatively, in the recent recession than in 1981-82. You can see the effects of the stimulus and, if you believe in stabilization policy, the timing is really good - government expenditure is high at the turning point, and until mid-2010, before declining. That decline is interesting, as you might think - if you listen to people who argue that the multiplier is really large - that this would have been a disaster. But I don't see the multiplier at work when I stare at that chart. Consumption just keeps growing at a steady rate, though that rate is lower than what we usually see coming out of a recession - for example, look at what happened in the 1981-82 recession. Probably the most important feature of the data in the two charts is the difference in the behavior of investment. 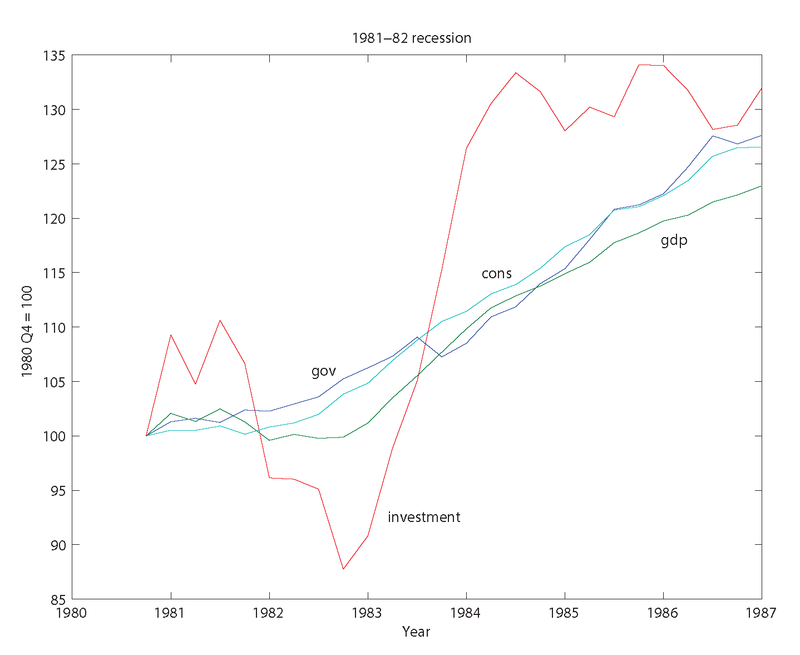 In 1981-82, investment declines by about 12% from the first observation, then rebounds significantly, to the extent that it grew more than consumption and output by mid-1983. In the last recession, investment declined by more than 30% from the beginning of 2007 to mid-2009, and in second quarter 2013 was still about 5% lower than in first quarter 2007. Thus, if there is something we should be focusing on, it's not multipliers and consumption, but why investment is so low. That low level of investment, over a five year period, has now had a significant cumulative effect on the capital stock. Thus, we've got OK growth in TFP, but growth in factor inputs is low. That's the key story, from a growth accounting point of view. 1. There are many frictions to think about. (i) There are financial frictions. Limited commitment and private information, coupled with a low supply of safe assets, can lead to the misallocation of capital and labor in the economy, for example. (ii) There are distortions caused by inefficient taxation and subsidies - for example in the housing sector. (iii) There is inefficient regulation at work, particularly in the financial sector, as we know well. (iv) Heterogeneity and private information in the labor market creates matching frictions, which can be exacerbated by sectoral shifts, and by financial frictions. With all that to think about, why focus on sticky wages and prices? Some people want to take the persistent level decline in GDP, and the persistently low GDP growth rate, as indications that sticky wages and prices are really important, when they should be thinking the opposite. As sluggishness persists, this casts further doubt on sticky wage and price frictions as being the source of the problem. People who cling to those sticky ideas, particularly the Old Keynesians, are either being lazy, or are simply unimaginative. 2. What should policy be doing? This is not a problem for monetary policy. The real effects of Fed actions, outside of crisis periods, are small and transitory at best. Whether by accident or design, the Fed has been doing a good job of controlling inflation, and should focus on that. If there are remedies to the poor real-side performance of the U.S. economy, those are fiscal remedies. There are plenty of things to think about: (i) further financial reform; (ii) housing and mortgage market reform - get rid of housing subsidies, Fannie Mae, and Freddie Mac, for example; (iii) health care: Congress should stop fussing about Obamacare - which is imperfect, but nevertheless an improvement - and do something useful for a change; (iv) education: If you believe the cross-country test results, the quality of American education in K-12 is declining, and we know there are huge disparities in access to good education. Some work points to a big payoff from early childhood education; (v) the problems in the north side of St. Louis, and in many other American cities, look very similar to those in the poor countries of the world. The problems may seem intractable, but we should be putting more effort and resources into solving them. The Americans tend to emphasize creating more jobs and less concern about the accumulation of public debt and printing more money, with which I’ve never agreed. The Germans tend to be more prudent and frugal like Canadians tend to be. First, Flaherty doesn't seem to understand that managing the size of the public debt is actually his job, and not the job of the central bank. Central banks may indeed be venturing into the traditional territory of the fiscal authority by engaging in QE, as QE looks more like debt management (altering the maturity structure of the outstanding government debt) than traditional monetary intervention. But QE cannot change the total quantity of consolidated government debt outstanding, only the composition of the debt, except perhaps indirectly. Further, in present circumstances in the U.S., QE is not "printing money." QE consists (in the QE3 operation currently underway) of swaps of interest-bearing reserves for long-maturity government debt and mortgage-backed securities. The reserves in question currently look more like short-maturity government debt than they look like anything we might want to call "money." The really funny part of the quote above involves Flaherty's unflattering view of profligate Americans. Apparently he hasn't been talking to the Americans who think of their government as ridiculously austere. Somehow Flaherty thinks that Canadians are more like Germans. I just don't see it. This reminds me of a joke, which goes something like this: Canada could have had American technology, British government, and French culture. Instead it got French government, British technology, and American culture.